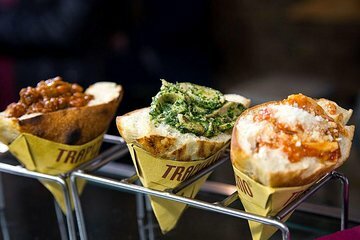 Conozca este barrio romano de Trastevere a través de su comida y su vino con este tour a pie de medio día. Visite cinco lugares favoritos locales para más de 20 degustaciones que incluyen queso, jamón, pizza, pasta y vinagre balsámico envejecido. Explore las calles adoquinadas de Trastevere entre los vinos y cervezas locales. Ahorra espacio para el último bocado del tour: gelato tradicional. Pruebe la comida, el vino y la cerveza locales en cuatro lugares. A nicely organized progressive dinner tour of Trastevere. Aly was a wonderful guide. Would recommend to anyone. We've been in Rome several times and every time we took a tour with different company. The tour was great , guide was brilliant and the the food was fantastic. Many thanks to The Roman Food Tour for the great time in Rome. I went on the Trastevere Roman food tour last week with my girlfriend and we had a fantastic time with our guide Raluca. She was funny, enthusiastic and knowledgeable. The food and wine tastings was exceptional and the venues were very welcoming.